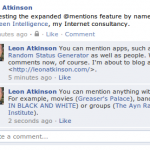 Do you use the @mentions feature in your status updates? If you type @ and immediately start typing a name, Facebook will suggest friends. Click on one and the name is inserted as a link. The friend will be notified and more likely to notice. Until now, this only worked in your own status updates. It now works in comments on anything posted to a news stream. Unfortunately, the @mentions feature does not work when updating status via the Graph API. Apparently it did at first, but app makers immediately used it to spam everyone with notices. Facebook yanked it. I would have preferred that they limited notifications similarly to how they limit how many news stream updates can go out in a certain time period. 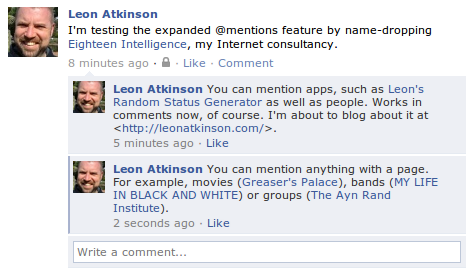 In addition to mentioning people, you can also mention pages and apps. Many of the things you “like” in your profile have underlying pages. If you’re mentioning a band or a movie you enjoy, try using the @mentions feature to make it easy for readers to find out more.